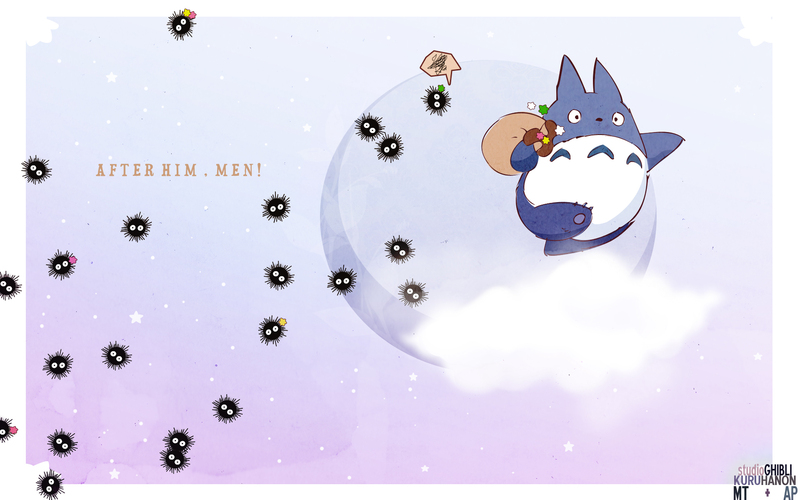 My Neighbor Totoro Wallpaper: After Him, Men! Minitokyo »	My Neighbor Totoro Wallpapers » My Neighbor Totoro Wallpaper: After Him, Men! EDIT: Having some trouble with alt versions/edited version. To find the updated/alternative versions of this, you can do so at After Him, Men! @ AP. Re-edited. Still not completely happy with it. I am so awful at any kind of background, I pulled the last, re-vamped, yet still--! Agh. Well hopefully this is a bit better. Found this scan and spied various susuwatari walls here at MT and also at AP when vectoring mah little sussuwatari. There is, alternatively, a textless version. Hope you enjoy; happy rest of your holidays! Cloud brush found here. Texture used from here. This is a great improvement from the previous one. Unlike the older one, this revision just flows and it looks well thought. Some stuff though: I just wished the cloud Totoro is jumping on wasn't that...circle-like. Because right now it looks like some circles placed together instead of a puffy cloud >_<. I have some mixed feeling on the text, don't get me wrong, I like it a lot but there's something off about it. I don't know if it should smaller with more space between the letters or bigger with less space. Aside that, I adore this, I'm glad you decided to rework it. I saw the previous version of this wallpaper, and I have to admit, this is a great improvement. It flows better and even feels more whimsical. I agree with Fran though, the clouds can be improved, and make to look less shape-like & more fluffy. Everything else however, looks wonderful. Great work~! Cute, simple and lovely soft colors. I really like this wall! Great work! Looks like a Totoro Christmas card and could've been if not for the word selection. Otherwise, after him!